Happy Sunday friends. We are loving the sweet pinks of warm weather combined with some sassy reds for that perfect punchy combination. Fun floaties are a must for the infinite amount of pool days all summer long. This pink and yellow one is simple and just adorable. The cherries in this clutch just top it with that 'WOW' factor. Pink sunglasses makes life prettier ( La Vie en Rose). Earrings are my thing for sure and I just fell in love with these three options- pink pearl earrings, tassel earrings and these pink and blue earrings. Also pearls and slides are meant to go together. Add some pink and you have the perfect combination- these and these are just precious. Framed Chinoiserie panels are an easy way to elevate a room. Use them as bedside decor (one on each side of the bed) or top of a sofa for instant elegance (see here for a more ideas). Colorful cocktail napkins are fun for that rose glass in the evening by the pool. I have some small glass vases that I use so often for flower arrangements. They are similar to these and just can't tell you how practical they are. And this striped lamp is just exciting. 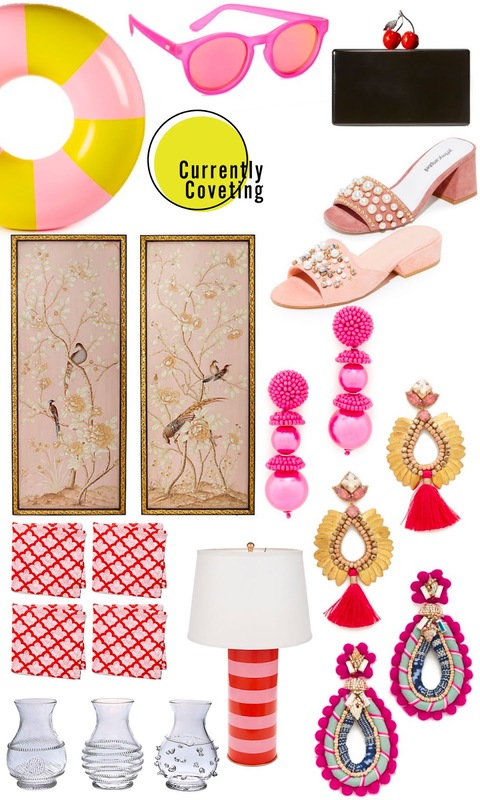 love all the earrings and the cherry clutch!! !